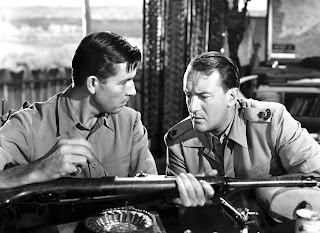 A World War Two adventure drama set in colonized Africa, Sundown carries the exotic feel of faraway military exploits but is hampered by low-budget production values and stiff performances. In a remote military outpost in British East Africa, commander William Crawford (Bruce Cabot) is trying to keep the peace while protecting Allied interests from the creeping dangers of the global war. Rumours of guns being smuggled into the hands of a local aggressive tribe cause anxiety. Major Coombes (George Sanders) arrives to increase a sense of readiness. Also in and around the base are Italian prisoner turned cook Pallini (Joseph Calleia), Dutch geoscientist Jan Kuypens (Carl Esmond) and local big game hunter Dewey (Harry Carey). The arrival of exotic and mysterious local leader Zia (Gene Tierney) signals the start of real trouble, as the suddenly well-armed tribesman Abdi Hammud (Marc Lawrence) threatens to lead his men in armed attacks against the outpost. Both Crawford and Coombes are infatuated by the alluring Zia, but they also have to find out who is supplying the guns and how to put a stop to the smuggling. Directed by Henry Hathaway, Sundown features an early role for Gene Tierney, with support from a decent cast including an uncredited Woody Strode in his debut. Despite the confused mix of African tribalism infused with Arab shadings interacting with British colonialism in a California Mojave desert pretending to be East Africa, the story does carry potential as a sweaty action drama set in a forgotten outpost as the dark clouds of war move closer. With Crawford's base accessible mainly by air, the film boasts an impressive number of scenes featuring assorted small planes taking off and landing in unforgiving terrain. But otherwise this is a case of ambition exceeding talent and resources, with the film's good intentions hampered by cardboard execution. The screenplay (co-written by Charles G. Booth and Barré Lyndon) is a stiff exercise in emotionless line delivery. The story, simple as it may sound, is bungled and tripped up by incomprehensible events, including characters wandering in a trance into battle and some horribly inefficient use of firepower. The action scenes border on amateurish, the acting is second rate at best, there are too many characters hanging around the base and none of them display any subtlety. The Italian Pallini emerges with the most animation, Joseph Calleia displaying admirable commitment, but while he emotes the others stand and stare, waiting for their next line. And when it comes to Ms. Tierney, standing and staring is what the film does. Hathaway insists on long lingering close-ups every time she makes an entrance, applying a freezing agent in time and space to allow the camera to get its fill. Sundown demonstrate how conceivably tasty ingredients in the jungle can be wasted in a rudimentary jumble.